"Scripture Truth" is a quarterly magazine full of sound and challenging Bible teaching. It celebrated its centenary in 2009. It regularly contains articles, studies, poems and points to ponder. The present editor is Dr Theo Balderston. The annual subscription for 2019 is £12.60 (post free) in the United Kingdom and £17.00 (post free) in the rest of the world. You can place an order for a subscription for the current calendar year and make an immediate online payment by debit card (in the UK) or credit card by clicking the appropriate "Buy Now" button below. We use PayPal to collect your payment, but you do not need to open an account with PayPal in order to pay. When ordering more than one subscription (specify the quantity on the first PayPal page), or ordering a subscription to be sent to an address other than that of the person making the payment, please provide the full postal addresses for delivery in the PayPal "Add Special Instructions to the Seller" section. When ordering more than one subscription, or ordering a subscription to be sent to an address other than that of the person making the payment, please provide the full postal addresses for delivery in the "Any Message" box on the page used to place the order. "Scripture Truth" was first published in 1909 by the Central Bible Truth Depot under the editorship of J T Mawson and H D R Jameson. 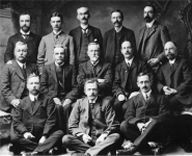 At that time, articles were scrutinised by a committee of responsible men amongst the Brethren: H J Vine, J T Mawson, H P Barker, F B Hole, H R Jameson, Mr Huntley, J Murray, Capt J W Smith, Hamilton Smith, Mr Bell, R Dunn, Robert Whyte and Walter Westcott. 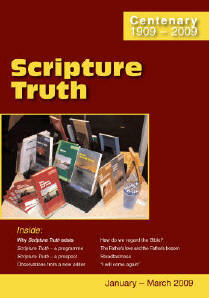 Indeed, much of the content of the early issues was written by them - and the content of many of the books published now by "Scripture Truth" Publications (and the Central Bible Hammond Trust and Central Bible Truth Depot in the past) first saw the light of day as articles in "Scripture Truth" magazine. In more recent years the magazine has been edited, solely or as part of an editorial board, by John Blackburn, Theo Balderston, Colin Curry, Bos Menzies, Jeffrey Brett and Gordon Hughes. You can read recent issues of the magazine online at the Scripture Truth magazine web site, and the first 50 volumes at the Scripture Truth archive. Bound volumes are no longer produced, but we do have some attractively bound back issues from former years (Vol.47 1980-82, Vol.48 1983-85, Vol.49 1986-88 and Vol.50 1989-91) available at £12.50 each.